As advances in computing power have made marine training via simulator more mainstream, the majority would contend that the most effective training is on the water, at the helm. 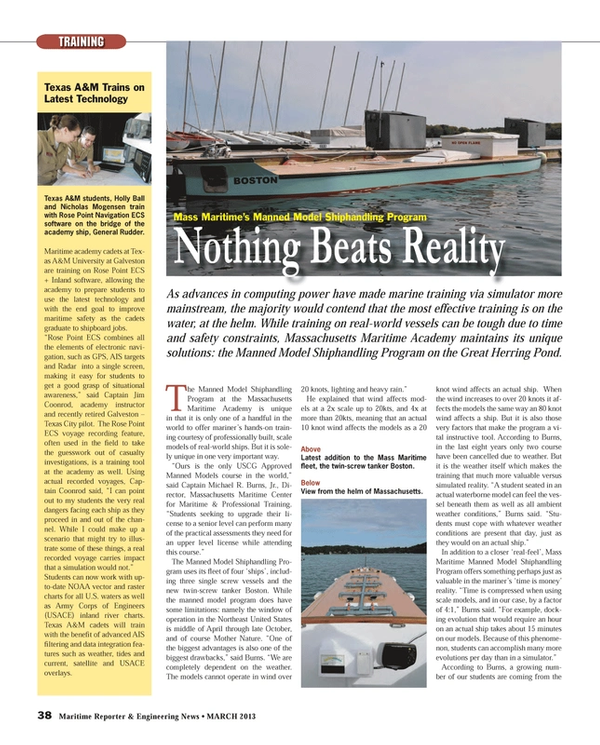 While training on real-world vessels can be tough due to time and safety constraints, Massachusetts Maritime Academy maintains its unique solutions: the Manned Model Shiphandling Program on the Great Herring Pond. The Manned Model Shiphandling Program at the Massachusetts Maritime Academy is unique in that it is only one of a handful in the world to offer mariner’s hands-on training courtesy of professionally built, scale models of real-world ships. But it is solely unique in one very important way. While Mass Maritime certainly counts its unique Manned Model Shiphandling Program as a feather in its maritime education cap, it is fully cognizant and supportive of the need for simulation technologies to produce a well trained mariner. When conditions keep its vessels in ‘port’, training is switched to MMA’s new Transas 360 degree Full Mission Ship Simulator and Tug and Tow Simulators that are available as back up for days that we are unable to use the models due to weather.